When our new range of Precious Moments stickers arrived in store, I couldn’t wait to get my hands on them. They are so adorable. I just had to get scrapping. And so I did! I chose the Precious Moments Graduation Girl stickers and created this simple but pretty scrapbooking layout. It’s perfect for photos of your little girl’s pre-school graduation or the completion of any of the younger grades. The design could also be easily adapted and other stickers substituted to match any theme you wish. I’d love to know what you think. Please let me know by leaving a comment in the box at the bottom of this page. This layout was created using dark purple Bazzill cardstock, Sweetwater In Love paper, purple cardstock, light purple cardstock, white cardstock, a purple pen, dark purple alphabet stickers and Sandylion Precious Moments Graduation G stickers. 3. Using a purple pen, draw a border around each strip, as shown above. Don’t worry about trying to make it too perfect. In this case, messy is good! 4. Glue Strip 1 horizontally across the bottom of your page. It should be approximately 1.5cm from the right edge and 1.8 cm from the bottom edge. 5. Glue Strip 5 horizontally across the top of your page. It should be approximately 1.5cm from the right edge (in line with Strip 1) and 1.8 cm from the top edge. 6. Glue Strip 3 horizontally across the middle of your page. It should be half way between the two strips you have already glued down and approximately 1.5cm from the right edge (in line with Strip 1). 7. Glue Strip 2 in the space between the middle strip and the bottom strip. The right edge should be approximately 1.5cm from the right edge of your page. 8. Glue Strip 4 in the space between the middle strip and the top strip. Again, the right edge should be approximately 1.5cm from the right edge of your page. 9. Mat two horizontal 4×6 photos with white cardstock and again with purple cardstock. 10. Glue one of your photos towards the bottom of your page approximately 4.5cm from the right edge and 4cm from the bottom edge. 11. Glue your other photo above the first photo approximately 5.5cm from the right edge and 4cm from the top edge. 12. Place a Precious Moments sticker in the bottom left corner of your page. I have chosen the sticker of the girl holding a bouquet of flowers. Place two small butterfly stickers on either side of her for decoration. 13. Place a flower sticker in the bottom right corner of your page. 14. Select the alphabet stickers you wish to use for your title. If you do not have stickers, you can cut them out from cardstock. 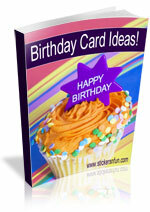 When you have chosen your letters, mat each one with light purple cardstock. Arrange them in the space to the left of your top photo, as shown above. Highlight them by placing a small butterfly sticker above them and a large butterfly sticker just below them. 15. Place another Precious Moments sticker to the right of your top photo, as shown above. Trim away any of the sticker that goes past the edge of your page. 16. Finally, place a large butterfly sticker towards the top right corner of your page, as shown above. What do you think? Do you like this scrapbooking idea using Precious Moments stickers? Do you have any questions? Would you have done anything different? We’d love to hear from you! Please leave a comment below. This entry was posted on Wednesday, April 22nd, 2009 at 10:18 pm	and is filed under Graduation, Scrapbooking Stickers. You can follow any responses to this entry through the RSS 2.0 feed. You can leave a response, or trackback from your own site.